When prices for a Hermès’s Birkin handbag can soar up to $300,000 for a diamond-studded, Himalayan crocodile–clad number, Barbara Segal’s $45,000 versions must seem like chump change in comparison. There’s just one catch: Segal carves her ersatz purses out of stone like orange calcite. Plus, they weigh about 100 pounds apiece. 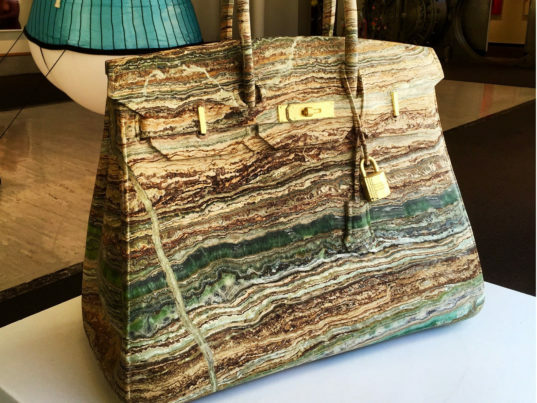 ““You can’t carry them around,” the Yonkers, N.Y.-based artist told the New York Post, “but so many women with Birkins just stare at [their bags]. They’ll say, ‘My bag is a work of art.’ Mine, too!” Segal is a stickler for detail. True to size, her “Birkins” co-opt the real McCoy’s signature folds, stitches, and embellishments. Each bag, she said, takes about three months to cut and chisel into shape. Hermès isn’t Segal’s only muse. 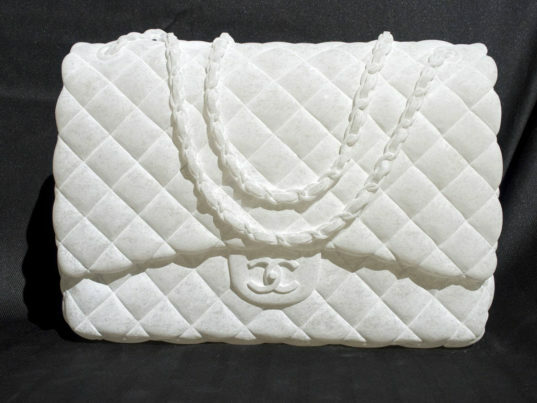 The Pratt Institute–trained designer also creates facsimiles of Chanel’s iconic quilted flap bag. Part of her “Designer Handbags” series, Segal’s copies explore society’s “long-standing obsession with status symbols,” she wrote on her website. “The stone purses underscore the inherent contradiction of man’s, and woman’s, never-ending quest for ephemeral prizes,” she added. Galleries are starting to take notice, too. From September 7 through October 5, the Krause Gallery on New York City’s Lower East Side will display Segal’s “Black Candy” bag as part of its “Emerging to Established” group show. And, coming full circle, even the fashion industry thinks her wares are covet-worthy. “I sold a Chanel piece to someone who works at Chanel,” Segal said. 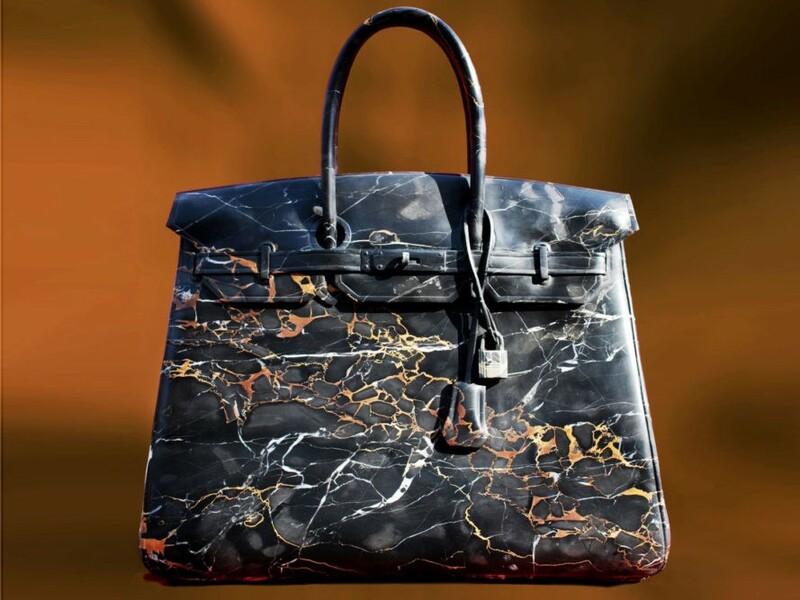 When prices for a Herm�s's Birkin handbag can soar up to $300,000 for a diamond-studded, Himalayan crocodile�clad number, Barbara Segal's $45,000 versions must seem like chump change in comparison. There's just one catch: Segal carves her ersatz purses out of stone like orange calcite. Plus, they weigh about 100 pounds apiece. "�You can�t carry them around,� the Yonkers, N.Y.-based artist told the New York Post, �but so many women with Birkins just stare at [their bags]. They�ll say, �My bag is a work of art.� Mine, too!" Segal is a stickler for detail. True to size, her "Birkins" co-opt the real McCoy's signature folds, stitches, and embellishments. Each bag, she said, takes about three months to cut and chisel into shape.